Happy October! We begin the countdown to Halloween and to kick it off, here are two books about everyone’s favorite bolt-necked, sewn up, misnamed monster, Frankenstein(’s monster)! 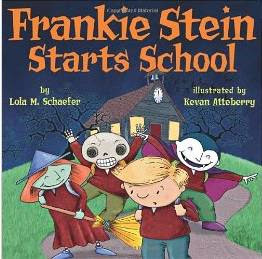 Frankie Stein Starts School by Lola M. Schaefer, illustrated Kevan Atteberry. Frankenstein and the Bride had a child, inexplicably. Even more inexplicably, he seems totally normal. So on his first day of school, all the other monsters are unfriendly and dismissive. But little Franke has a couple scary tricks up his sleeve. He can horrify with the best of them, howl like a proper beast, and draw some grotesque creatures. Needless to say, all the monsters suddenly approve of and like him. Although the story is primarily about prejudgement it is not really discussed. In my opinion, this book has nothing to offer. It’s not very clever, it’s not well-written or well-illustrated, it’s not worth picking up and reading. Though it may bore you or your child to sleep. 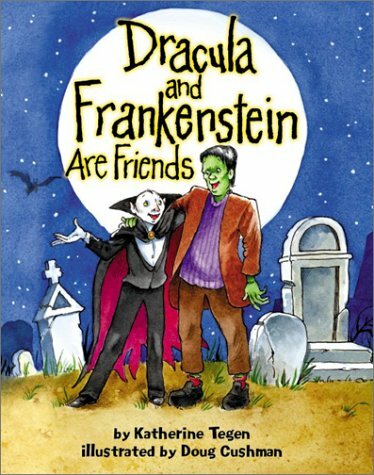 Dracula and Frankenstein are Friends by Katherine Tegen, illustrated by Doug Cushman. This one’s a little bit better. Frankenstein is a bit shy but lovable. Dracula, his friend and neighbor, is more outgoing and kind of a jerk. When Frankenstein decides to throw a Halloween party, Dracula decides to throw one too, stealing all the invitations from Frankenstein’s mailbox so no one would go to his. But while Dracula’s big bash is in full swing, he sees sad Frankenstein alone at his party. The bloodsucker, in a rare moment of guilt, takes the party to Frank. A little subtle humor and some funny illustrations save this book from the dud list.